When I called home and asked the Intrepid Junior Blogger if I should buy tickets to the event I knew the answer would likely be yes – but even I had not predicted her level of enthusiasm. She expressed great excitement, and insisted I get tickets as soon as possible. The event in question? 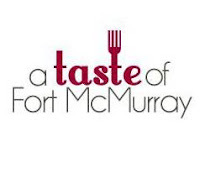 Not a rock concert or festival – but rather the annual A Taste of Fort McMurray. The IJB attended Taste of Fort McMurray last year, and I guess it made an impression on her. Maybe it was trying kangaroo, or simply all the cupcakes – but this year she not only wanted to go but insisted, and when I arrived home Wednesday night after work she was ready and anxious to tackle the food – and oh, what food it was! We arrived at MacDonald Island Park, exchanging our tickets for passports that we immediately disregarded, explaining to the passport stampers that we were focused quite keenly on the food, and only the food. She and I never have been much for rules, and so we tackled the food stalls with gleeful abandon, mixing appetizers with desserts and entrees. We ate our way through every booth, sampling endless varieties of sliders and cupcakes, soups and scallops. We aimed for the restaurants she cannot enter, being a minor, and sampled the offerings from Wood Buffalo Brew and Original Joe’s. We ate and ate, stopping for an occasional drink, and then we ate some more. We ate enough to determine our favourites – and it was not an easy conclusion. For the Intrepid Junior Blogger the favourite was the lamb from the Hearthstone Grille at the Sawridge Inn, followed closely by the ribs from Table 63 at the Quality Inn. I was quite partial to the pork belly from MacDonald Island Park, and we both found the chocolate cake in an ice cream cone from The Chef’s Table at Mitchell’s a delight. We did not, in fact, find any food we did not enjoy, and while some particularly caught our attention all the food was wonderful to experience. And we ate cupcakes, of course, ones infused with Bailey’s and chai tea, and ones that tasted of cherries. In fact by the time we reached the Chocolates and Candlelights booth we were relieved that the chocolate was packaged to take home, because we couldn’t eat another bite. I think the IJB was a little sad there was no kangaroo this year, but the event brought out her foodie side, as she is the true food lover in the family and she critiqued her way through the samples (should she ever write a food blog I think it would easily surpass this blog as she is both unflinchingly honest and accurate in her assessments, with a very fresh palate and a young adult perspective). We both enjoyed the entire evening though, from the food to the live music to the helpful and friendly volunteers. In the end, though, just like last year we rolled out the door, feeling significantly heavier than when we arrived. We headed home, the IJB downstairs to the sofa and me upstairs to finish some chores. Just before bedtime, though, I snuck into my purse and pulled out two small gift-wrapped packages. I opened one, and then took the other down to the IJB. And so we finished off a night of food and fun – and an evening spent together – with a chocolate covered pretzel, perhaps the perfect way to end the night. Buddy, Can You Spare a Ward? Down With Protests, Up With Geography Lessons!